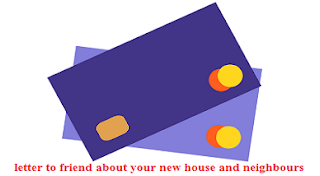 You will be happy to know that we have purchased a new house in a posh colony of West Delhi. It is in Raja Garden. The place is extremely calm, quiet and serene. There is no din and noise. The streets are quite wide and spacious. The house itself is situated at a nice plot of land. It is a corner plot. It is quite advantageous. It opens on three sides. It is a double-storey house. There are three rooms in the front portion and three in the rear of the house. It is airy and well-ventilated. There are marble flooring. The walls are painted very beautifully. The pride of the house is its kitchen and bath-room. Both are fully tiled. There is a beautiful marble tub inside the bath-room. There are metallic fittings. There is also the provision of telephone shower. There is a system of cold and hot water. I have my own separate room for studies. Our new neighbours are very nice people. On the right of our house is Mr H. L. Juneja. He is a postgraduate teacher. He teaches Mathematics. He holds many groups for coaching at home. These groups of boys and girls speak highly of his ability and hard work. On the left is Mr O.P. Dang, an officer in NBCC. He is thoroughly polite, courteous and gentle. I invite you and your parents to visit our new house.